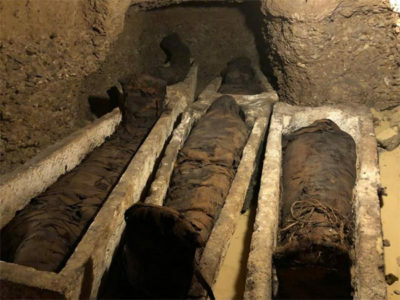 CAIRO - 2 February 2019: Minister of Antiquities, Khaled El-Enany, declared that a joint mission from the ministry and the Research Centre for Archaeological Studies at Minya University had unravelled at Tuna El Gebel in Minya a collection of Ptolemaic-era rock burial chambers, with more than 40 mummies, including men, women and children. This discovery marks the first antiquities discovery of 2019. https://twitter.com/antiquitiesof/status/1091675532767449089?s=12 In 2018, Egypt witnessed a wealth of new fascinating and notable archaeological discoveries, it seems that 2019 will be no different. 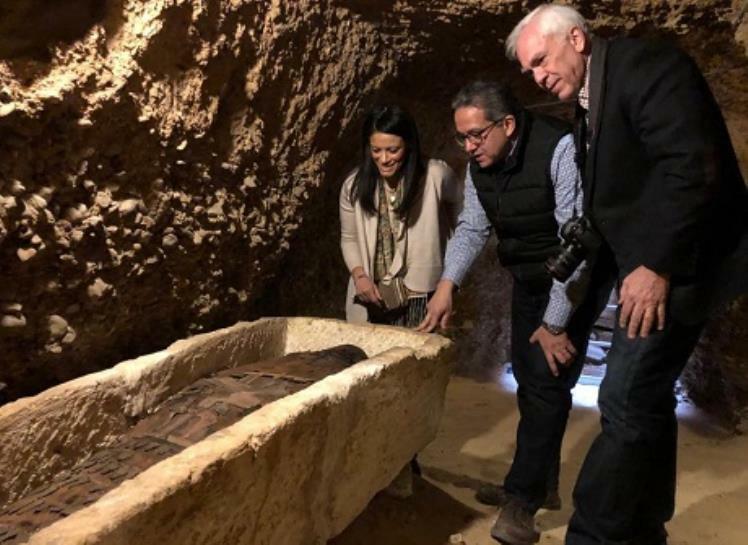 This morning, Minister El-Enany announced in Tuna El-Gebel necropolis in Minya governorate, in the presence of hundreds of media and officials the discovery of a maze of Ptolemaic burial chambers filled with more than 40 mummies, including men, women and children. 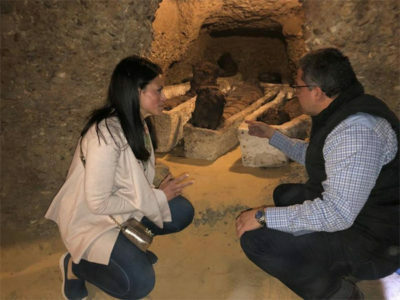 The minister affirmed that the newly discovered tombs are a familial grave, and declared that they are probably for a family from the upper middle class. The head of the archaeological mission, Wagdi Ramadan narrated how the mission had started its work for the first time in Tuna El-Gebel in February 2018, and that this burial is the typical burial style used in Tuna El- Gebel, which once was the necropolis of Egypt’s 15th nome during the late New Kingdom and the beginning of the New Intermediate Period. 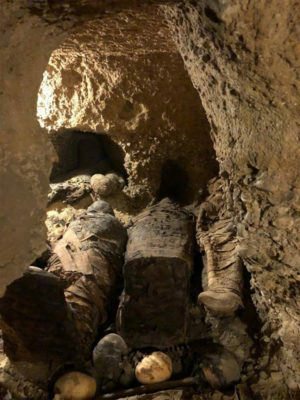 "The mummies are all in a good conservation condition and some are wrapped in linen, or decorated with Demotic handwriting." said Minister of Antiquities, Khaled El-Enany. 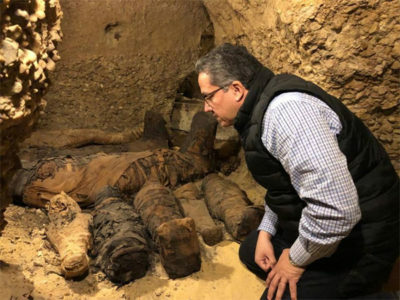 The Secretary General of the Supreme Council of Antiquities explained to the attendees that the methods used in burying the mummies inside the maze of tombs varied in style, and some of the mummies were inside stone or wooden sarcophagi while others were buried in sand or were laid on the floors of the tombs or inside niches. 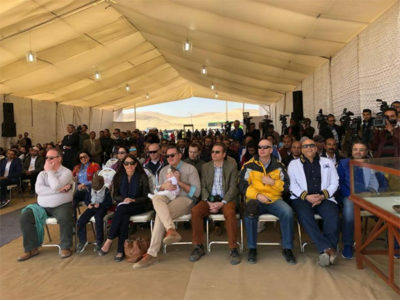 The announcement was made in the presence of Rania Al-Mashat, the minister of tourism, Essam El Bidawy, the governor of Minya, Major General Kassem Hussein, Mostafa Waziri, the secretary-general of the Supreme Council of Antiquities, and ambassadors and cultural attachés from 11 foreign countries, among them Malta, the Czech Republic, Spain, Serbia, Ireland, Belarus, and China, along with their families, as well as Mostafa Abdel-Nabi, the head of Minya University and members of parliament from Minya.